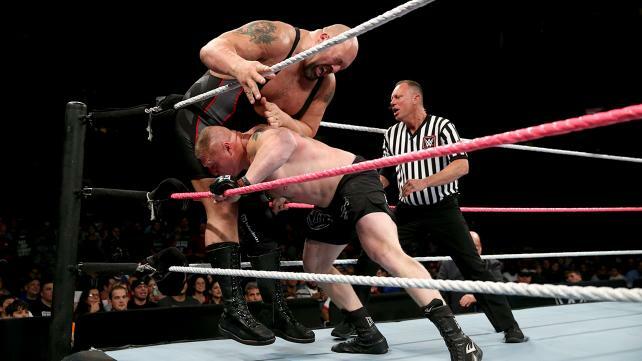 WWE’s house show in New York City several weekend’s ago on October 3, 2015 drew a lot of attention, mainly due to the in-ring return of Brock Lesnar. He was going to lock up against the Big Show in one of the evening’s featured matches. Even though we all knew Lesnar was going over, the match had a big time atmosphere to it and the event itself was well-presented. It helped that the show was in Madison Square Garden because everything in that venue feels important, even Knicks games (no small task lately). Regardless of Lesnar’s booking I tuned in for another reason: I have always love house shows! When was the last time a house show was promoted like this? As I was watching I kept asking myself – why doesn’t the WWE broadcast MORE of their house shows?! There is an “earthiness” about them, like they belong to that particular city on that particular night. RAW, SmackDown, and the rest of WWE’s broadcast shows all feel like stylized TV shows that are more for the viewers at home than the people sitting in the crowd. Don’t believe me? Have you been to a live RAW broadcast? I’ve been to several and I always find myself disrupted by the frequent commercial breaks and lengthy in-ring promos. Several years ago I took my family to a house show in Salisbury, MD – we went to see my beloved Glamazon Beth Phoenix wrestle Mickie James – and we had a great time. Sure, the set was stripped down, the sound system was bad, and the overall card was very average. But we felt like we were in an old-school wrestling environment where people were cheering, eating popcorn, and enjoying the sport of professional wrestling. The WWE stars tailored their matches to cater to the smaller crowd and engaged many of the people sitting ringside. Other than Mickie James going over, the night was a success, especially because we didn’t have to wait 30 minutes for concessions and souvenirs. Sometimes smaller is better. House shows don’t feature the production value of the weekly TV line-up but that’s OK. One actual match after another is not a bad thing. Not to mention that house shows usually give the talent more time to tell stories in the ring and to actually, you know, wrestle! 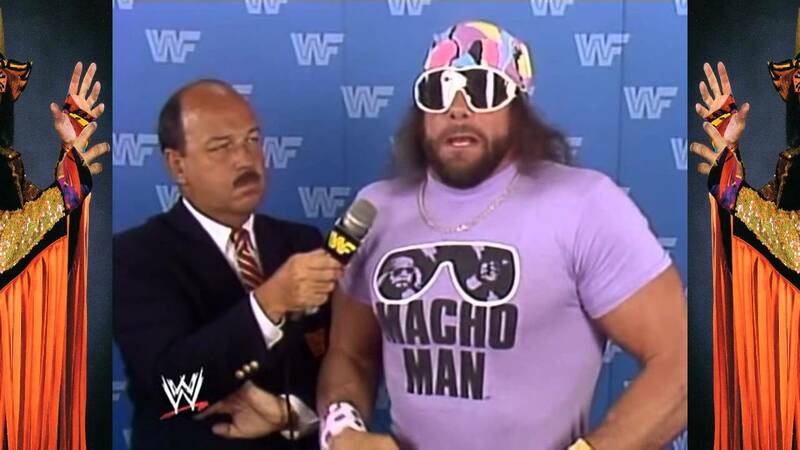 Don’t get me wrong – I like the big spectacle of WrestleMania as well. I’ve been to 7 in my lifetime and I’m disappointed to be missing #32 in Dallas. But I like the mix of big-time production events and old school wrestling cards so I’m disappointed with the evolution of actual WWE house shows. In the old days house shows were a big part of following WWE. 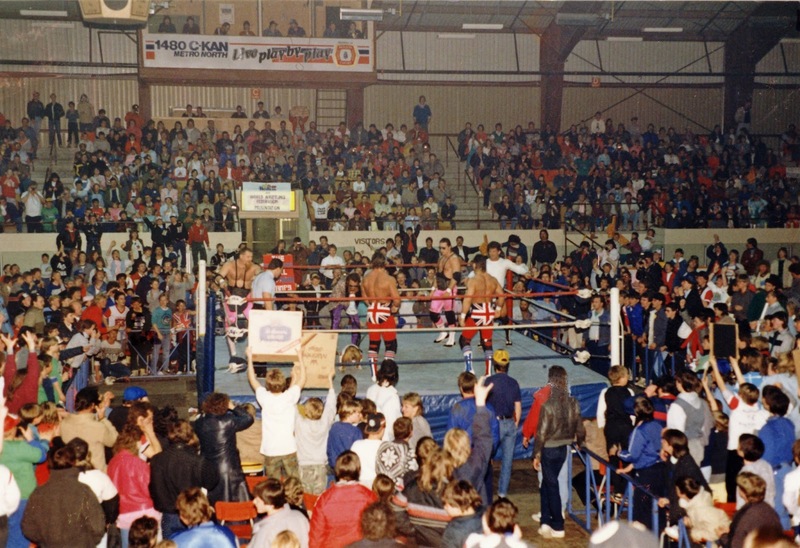 The newer fans might find that hard to believe because the house shows today don’t draw like they used to, but when you would see highlights on USA Prime Time Wrestling from classic venues like the Boston Garden, Toronto’s Maple Leaf Gardens, and MSG, the crowds were HOT for those shows! I grew up going to the Hershey Park Arena and WWE came through town approximately every month. I can name 100 things I loved about those house shows. 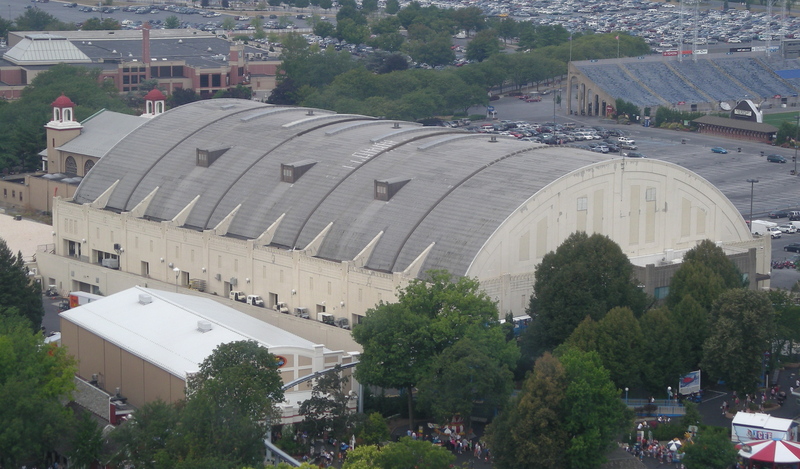 Even the Hershey Park Arena was a gem of a building, that’s why 3 Saturday Night’s Main Events were filmed there – well, that and because that’s where the wrestlers got all of their steroids. But the shows were a nice showcase for WWE’s “other” stars and I enjoyed the preliminary matches, ones that saw Tiger Chung Lee and Iron Mike Sharpe actually get to perform instead of getting beat in 2 minutes on Saturday television. I imagine they enjoyed those nights too. The Hershey house shows usually had different types of matches than you would see on television, like Bunkhouse brawls and 6-man steel cage matches. Sometimes managers would be suspended from a cage above the ring. One of the most exciting aspects of the house show was to buy one of the WWE programs with the run sheets inside of them. My buddy and I would scramble to our seats and then slowly, slowly pull out the sheet to see who was appearing that night. 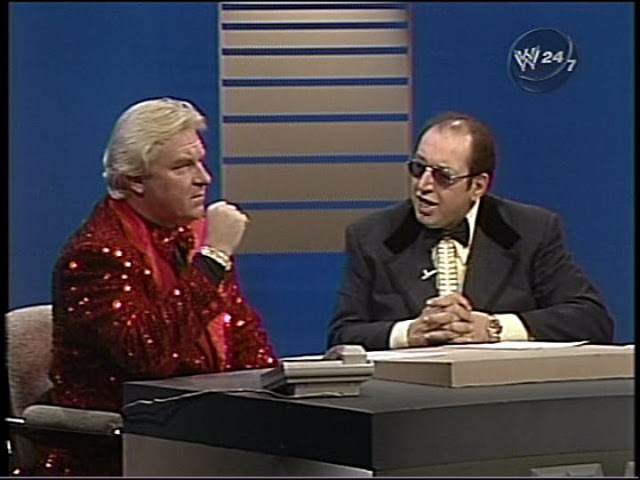 Mean Gene would advertise the big matches, but it was always the secondary matches that rounded out the card and made it a full evening. By the way, these house show line-up cards are excellent souvenirs. I have about 150 of them from various shows around the country and they are fascinating to read. You’d be surprised how many of them contain misspellings and incorrect information. Not to mention how the same show would be presented several times on the same day. Damn these guys were on the road a LOT! One criticism of house shows is the belief that “if it didn’t happen on TV, well, then it didn’t happen.” I understand that philosophy and in some ways I think that has hurt the house show business. It is difficult to have title changes and major angles play out in small venues, so more often than not house shows were continuations of the angles we got on TV. In some ways the WWE overcame this shortfall by hosting “return matches” the following month. If the Hart Foundation weaseled through another title defense vs. the British Bulldogs, don’t worry because next month, right here in Hershey, PA, they will meet again but this time in a steel cage! Trust me…those kinds of announcements made live and in person definitely worked in the 1980’s. I was fortunate to attend all 3 tapings of Saturday Night’s Main Event filmed in Hershey (including the iconic night the “Madness Met the Mania”) and those were all good shows. I wouldn’t say the same for the times I was there for tapings of Wrestling Challenge. I remember watching close to 25-30 matches…almost all of them squash matches…filmed for the next full month of WWE television. Most guys would wrestle 2-3 times, and occasionally there would be a B-level match like “Cowboy” Bob Orton vs. Don “The Rock” Muraco. The main event was usually fine but the entire night felt like a second rate TV show. It lacked the intimacy of the old house shows. This night didn’t belong to “us”…it was for the television crowd. The WWE can’t film weeks ahead of time now because of the Internet spoiling the results (Insert a TNA joke here)…but regardless there is still too much original programming on each week. Each episode of Raw or SmackDown is now full of pay-per-view caliber matches and after a while I think they all blend together. One Monday Night Raw feels like any other. That’s why I don’t go to the ones in Washington DC or Baltimore. It doesn’t feel regional or special. The show might as well be in Cleveland. Even the arenas all look the same now. It’s hard to argue with the success of the WWE especially when you look at the attendance of pay-per-views and the sales of superstar merchandise. Vince wants to make money and he certainly is. I just wish the house show circuit wasn’t such an after-thought. I think people like house shows, especially because they can afford better seats (due to cheaper ticket prices) and they can feel more a part of the action. They can get closer to their favorite superstars and Divas. If the WWE Network would show MORE of the regional house shows it would help the shows themselves feel more important. We saw this with the recent Madison Square Garden show. 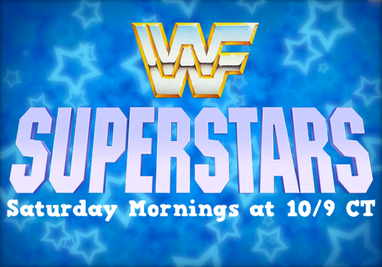 I’d like to see more of these shows, like we used to on USA’s Prime Time Wrestling, instead of filler like Legend’s House. ← Previous Story Can Seth Rollins Win a Fair Fight? Next Story → Did TMZ Ruin WWE’s Angle?